It has been quite a hectic weekend as 175 dancers along with faculty, guest artists and musicians have arrived to participate in the Professional Training Program. Our staff and interns worked all Saturday to help check people in, shuttle them to their dorms and get them settled before a busy week starts. Almost all of the participants joined us at Schaeffer Theater Saturday night to see the beautiful Doug Varone and Dancers in a sold out show. Sunday our Admission Director, Meredith Lyons worked all day with students to help them craft their schedules. Class change day is something unique to BDF that we do each year to ensure that all our students have a well rounded schedule that they will enjoy. Students have a chance to meet directly with Meredith to see what classes still have slots open and discuss what might be a good fit for them. Students will have another chance today and tomorrow to change their schedule now that they have started their classes and experienced the teachers. 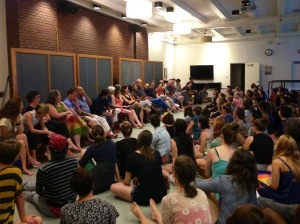 All the festival participants and faculty met Sunday evening in Chase Hall for orientation. While those of us who have been here for the past three weeks are still adjusting to the new energy on campus, we are incredibly excited for all the events, performances and classes coming up. There is a huge shift that happens here over just one weekend, as our young dancers head home and a flood of professional level dancers arrive. This second half of the Festival is even more jam packed with classes, events, performances, dance parties and workshops. Plus the number of participants almost triples in size! Last night during our orientation we met over 20 of the amazing faculty and musicians. So many wonderful instructors and artists from around the world are here to work, perform and teach. I am looking forward to getting to know each of them in and out of the studio. So wish us luck as we dive into the Professional Training Program! -Posted by Caroline Barna. Caroline is BDF’s Social Media Intern for the 2013 summer.